Going for a walk yesterday, I noticed this robin on a fence rail. Not so long ago, the sight of a robin meant spring was here or would be very soon. But, they increasingly have been staying throughout the winter and I've seen flocks of them in my frozen crabapple tree this year. Well, as long as they can find food, they will have saved themselves a very long and tiring trip. I am beginning to wonder if they will forget how to migrate! 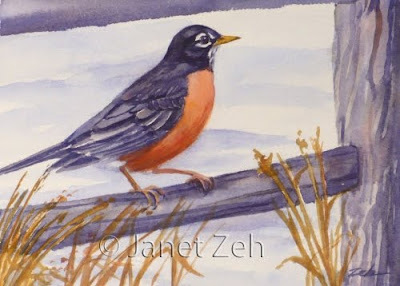 The original has been sold, but check for more of my bird original art in my Etsy shop, JanetZeh.Etsy.com. Thanks and have a beautiful day!